After scoring six second-half goals in their first two matches of the season, the No. 4 Maryland Terrapins men’s soccer team finally got off to a fast start Friday against Stanford. 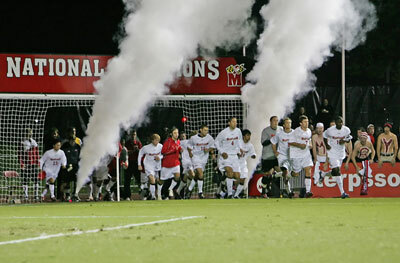 In front of 7,178 fans, the second-largest crowd ever at Ludwig Field, the Terps scored four first-half goals, the team’s most since scoring four, two of them from Casey Townsend, against Duquesne on September 15, 2009 in what would be a 7-0 victory. The Terps proved their speed to be a mismatch against the Cardinal (0-2-0) from the get-go. Patrick Mullins (2) found the back of the net just 22 second into the match. Casey Townsend (2) followed up in the 10th minute with a left-footed strike from 12 yards out. In the 28th minute, Helge Leikvang (1) curved a free kick over Stanford’s wall and past Cardinal goalie Jason Dodson. Just like in Maryland’s four-goal first-half against Duquesne two years ago, Townsend (3-30th) scored his second goal of the half and the Terps built what would be an insurmountable 4-0 lead. Maryland goalkeeper Will Swaim did not need to make a save and picked up his second shutout of the season as the Terps improved to 3-0-0. Maryland will host Radford (1-1-0) tonight at 7 p.m. as head coach Sasho Cirovski seeks his 300th career win. The Highlanders are coming off a 2-0 loss to Georgetown on Friday. College Park is the third stop on their six-game road-trip to begin the season. Maryland has outscored opponents 10-1 this season. John Stertzer and Casey Townsend lead the Terps with three goals apiece. Radford sophomore Luis Grande was named the Big South Attacking Player of the Week after his golden-goal 49 seconds into overtime to give the Highlands a season-opening victory over Appalachian State. Chel Ho Kim Park assisted the goal. You can listen to the action on WMUC Sports at 6:50. I will be on the call along with Eric Morrow. This entry was posted on September 4, 2011 by Scott Kornberg. It was filed under Maryland Terrapins, Soccer and was tagged with Cardinal soccer, Casey Townsend, Helge Leikvang, Highlanders soccer, Maryland, Maryland soccer, Maryland Terps, Maryland Terrapins, Maryland Terrapins soccer, Patrick Mullins, Radford, Radford Highlanders, Radford Highlanders soccer, Radford soccer, Sasho Cirovski, Scott Kornberg, Stanford, Stanford Cardinal, Stanford Cardinal soccer, Stanford soccer, Terps soccer, Terrapins soccer, Will Swaim.